The RC6000/A Control Display Unit features an intuitive user display with large control buttons for gloved users and high vibration operation, cockpit certified to -45º C. The RC6000/A CDU has an integral switch button for “emergency” notification, “down and clear” reporting, and a “mark” button for designating locations. 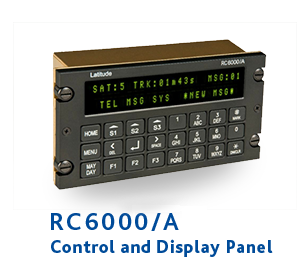 In addition to free form messaging and telephone book, redial and other features, the RC6000/A display has visual cues for satellite signal strength and connectivity. Its VFD display is 2 lines, or 48 characters total, and interfaces to existing SkyNode products including the S100, S200, and IONode models. Dzus rail mounted panels are very compact at three inches in height and weigh less than a pound. The RC6000/A is a highly robust display and is currently certified on both Bell and Eurocopter models.